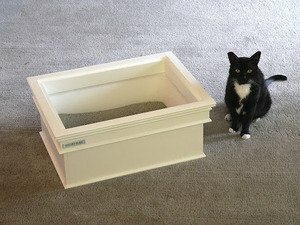 Five Pet Place is a San Jose-based e-commerce website that specializes in high-end cat products. For Super Bowl XLVII fans, that probably means nothing…except the company’s “spokescat,” Mr. Nuts, predicts the San Francisco 49ers are going to lose Sunday’s big game to the Baltimore Ravens. Mr. Nuts’ litter boxes illustrate which entity will lose a particular contest, such as an election or sports event. The claim would be absolutely laughable, yet the black-and-white feline has a perfect 3-0 record when predicting the outcomes of major contests. But rather than choose the winner, Nuts selects the loser. When determining the outcome of an event, the cat is presented with two separate litter boxes, each representing a competing entity. Whichever box gets the cat’s the deposit will lose. To date, Mr. Nuts correctly predicted the Super Bowl loser in 2010 (Pittsburgh Steelers) and 2011 (New England Patriots); he also selected Mitt Romney to lose the 2012 presidential election to incumbent Barack Obama, and correctly predicted Prince William and Kate would have a son (which was revealed on July 22, 2013). “Now he’s going against the grain by not only picking the favored 49ers to lose — he’s doing it despite living in the middle of the San Francisco Bay Area.” Michael Ostrofsky, founder of Five Pet Place and the cat’s owner, says on the company’s website. “Want a pat on the back? Call a friend. Want the truth? Ask Mr. Nuts because he’ll tell it like it is whether you can handle it or not. Come Sunday, we shall see. And, yes, the cat was named after his manhood(s), but he has since been fixed.